This is how my New Kitchen began….. 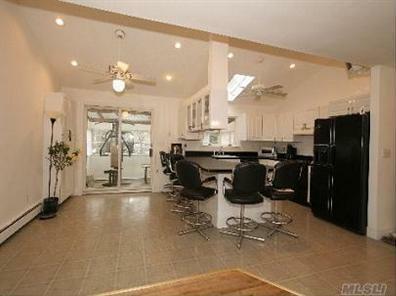 These were the pictures we saw on our Multiple Listing site when we were looking for houses 3.5 years ago. We were very excited that it was a nice looking white kichen. We would just need some new flooring. So we went to see the house. Well the house was NOT well kept at all. There were many animals in the house and there were even “urine” stains on the hardwood floors. Yuck!!! As nice as these cabinets might look in the pictures, they were really gross and dirty on the inside. There was even nail polish on the black countertops. At first we thought we would just replace the countertops, but that didn’t work out because some of the base cabinets were not level and you can’t install granite on unbalanced cabinets. So we started to do some homework and see how much a new kitchen would cost us. At the time we didn’t know that much about kitchens and owning a home. There are a lot of things we would do diffently the next time. These pictures are from after we closed on the house. ﻿You can see from this picture how small the kitchen footprint really is. The pictures from the Multiple Lisitng Site were misleading because they use a wide angle lens that makes rooms look bigger then they really are. Sneaky!!! They call this a “G” shape kitchen layout. I called it “this-is-not-enough-room-for-me-kitchen-layout”. So the planning really began. The stove was so gross, I couldn’t even think about ever cooking in it. It had to go…..it all had to go. We cleaned the frig and the next day when we came back to work on the house….the frig was dead. HAHA!!! I have to laugh about it now, but thank god we weren’t living their for 4 months until all the work was done. 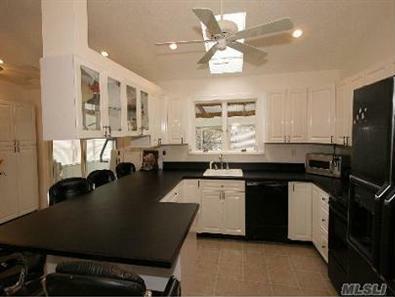 This picture is the cabinets that are right above the countertop on the left side of the first picture. I didn’t like these at all because you had to duck down to see anyone that was in the kitchen. Plus they were mostly for display and I didn’t want them. Taking this down really opened the kitchen up. Here we have the lovely peal and stick tiles over ceramic tiles (don’t ask we still don’t know why) and the wood floors that are in the Living Room. That is the hallway to our bedrooms and bathroom. And the ugly banister that we replaced. More on that later. We went to Home Depot and this is what they came up with for us. It’s a free service and you don’t have to buy. But please make sure you check with your local Home Depot before starting something like this and make sure it’s still free because this was 3.5 years ago. We knew we wanted to open that “G” shaped layout and this is what they came up with. We also wanted an island in this kitchen. This is what the island would look like from inside the kitchen. We knew we wanted something bigger and the room could handle something bigger too. So we ask for one more idea for the island. This is what they came up with….love it. We changed it a little once we hired our contactor, but we are glad we made the little change. We didn’t make a half wall like the drawing below, we just used the base cabinets with a slab of granite on top for the island. We love it. We also made little changes to the cabinet design as well. More details on that soon. The construction started about a month later after we hired a contractor. All the cabinets are down and the flooring is gone as well. The hallway to the bedrooms with the flooring gone. We installed all new hardwoods throughout this floor. So that is a tour of how our new kitchen was born. Next post I will take you through the “During” and the “After”. Thanks for stopping by. Please leave a comment, I would love to hear from you. Have a great weekend everyone!!! You could decide that you do not want to remodel your kitchen countertops, and would rather just focus on a particular part of it, such as your worktops or floor. Or you could go for redecorating the kitchen and see how this looks. I don know that you will ever be able to avoid this completely, but if you create an area for tools it will help a great deal.